The Westin San Diego’s angular design is a landmark in the skyline of this Southern California city. The sophisticated setting begins in the atrium lobby, 100 feet high and filled with light reflected from dangling prisms. The crystalline hotel is in the heart of San Diego’s downtown, and the 25 floors feature guest rooms with panoramic views of San Diego Bay, Coronado Island, and the downtown skyline. 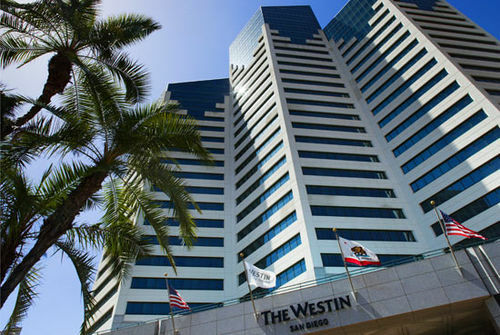 The Westin San Diego is convenient for business and recreational travelers alike, as it’s located within walking distance of Little Italy, the Convention Center, the San Diego Gaslamp Quarter, Seaport Village and an array of shopping options. The hotel is also convenient to major attractions, such as Balboa Park, the renowned San Diego Zoo, Sea World, Old Town, the USS Midway, and the area’s breathtaking sandy beaches. The Westin San Diego’s meeting space comprises 22,000 square feet and includes state-of-the-art technology in a space large enough to accommodate groups of up to 500 people. The hotel also offers a 24-hour fitness center, outdoor heated pool, and indoor and outdoor spa tubs. Because of the hotel’s unusual design, the 436 guest rooms come in a variety of layouts and provide different views of the city. However, all rooms include pillowtop mattresses, high-quality bed linens, down comforters, and feather pillows. A coffeemaker, minibar, in-room safe, and flat-screen TV can also be found in the rooms. Internet access is available for a fee. The dining options at the Westin San Diego include 400 West, a contemporary restaurant specializing in Italian and California cuisine, and the Aroma Café, which serves coffee and pastries. The Bar offers cocktails and occasionally hosts live entertainment. Special Condition: Beginning January 1, 2008, the San Diego Hotel and Motel Association members approved a marketing assessment of 2 percent at all hotels in the city of San Diego that have more than 70 guest rooms.